Spring is finally, finally here. I’m at my desk looking out at cherry trees blooming and daffodils pushing up out of the dirt. My friends at Recipe Redux are as excited about all the spring holidays – Easter is April 1 and Passover begins March 30 – as I am so all the dietitian food bloggers are posting our favorite spring recipes for you. I’ve got the best Simple Edamame Pasta Salad around that you can take to any gathering, pack for work lunches or take on a picnic once it’s warm enough. This Simple Edamame Pasta Salad is a complete meal and a salad that will keep you full for a long time. Whole wheat pasta has a good amount of fiber and a nuttier, chewier texture than regular white pasta that I personally prefer. 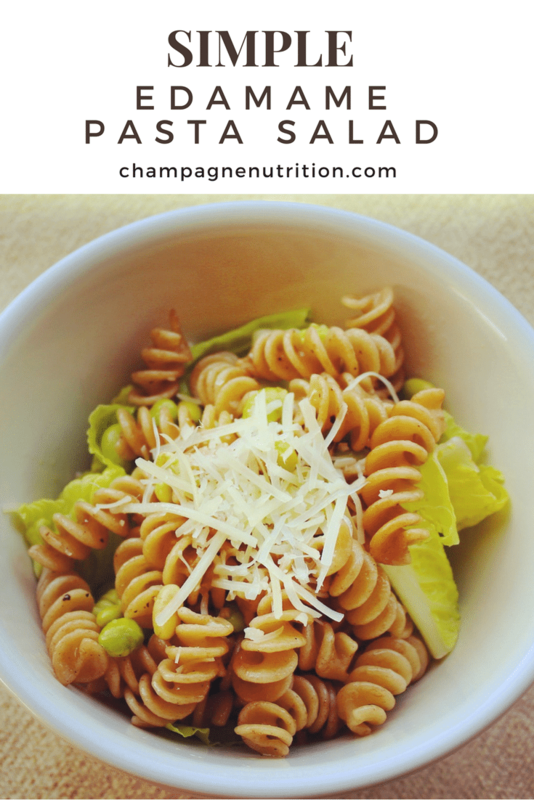 The pasta and edamame part is tossed in a light, versatile dressing and served over spring greens to maximize the green leafy veggies you should be getting daily. Edamame is an amazing food that is sometimes underrated. These soybeans are rich in fiber, protein, vitamins, minerals and antioxidants. They are versatile to cook with and taste delicious in Simple Edamame Pasta Salad and beyond. My dietitian friend, Steph the Grateful Grazer, has a whole post on the myths that surround soy. We both have a passion for this information because we worked in an oncology center for years and heard so much misinformation and confusion on the subject of soy in the diet. Cook pasta in a large pot of boiling water according to package instructions. Add edamame during the last 4 minutes of cooking then drain and set aside to cool in a large mixing bowl. In a separate mixing bowl, whisk together lemon juice, olive oil, vinegar, salt and pepper until combined. 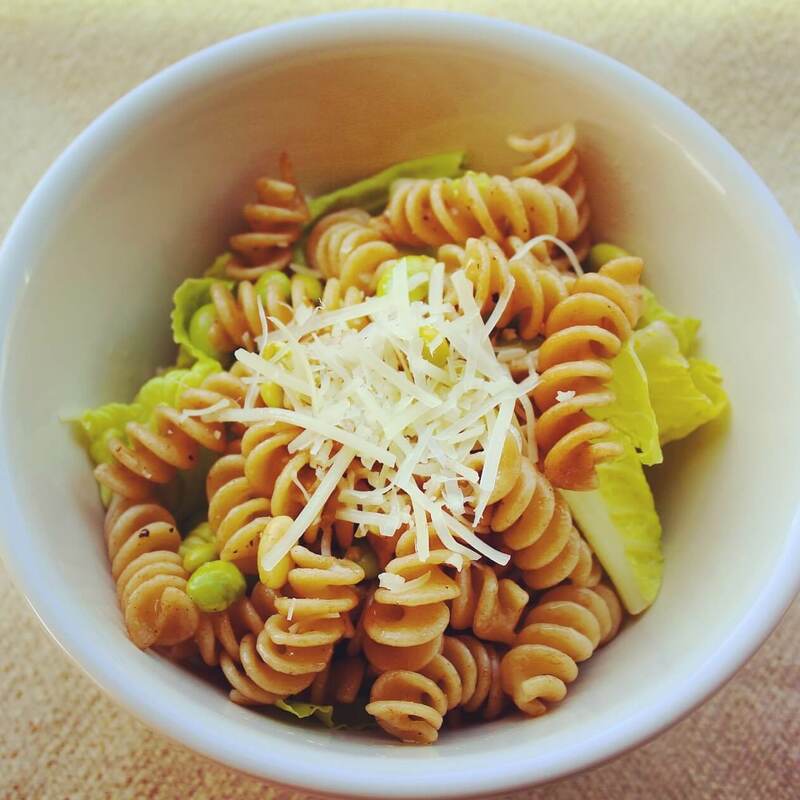 In a large mixing bowl, dress the pasta and edamame with the vinaigrette. Serve over fresh romaine in salad bowls and garnish with Parmesan if desired.